I have so many thoughts on this book I don’t know where to start. I’m not a crier, but it had me teary. I like to think I’m quite brave, but it had me unsettled. The most conflicting part of all for me: this is a children’s picture book…It’s not something I like to make a habit of thinking about, but brushing the idea of dying to one side until it’s suddenly brought into sharp focus can’t be the way to go. Maybe a children’s picture book is a good starting place after all? teaches you to at least try to see the gift in mortality. Whether or not you will want to read it to a child — though of course life will present limitless moments when it will be appropriate — is up to you. Chances are you’ll want a copy for yourself. The most extraordinary picture book I’ve seen in many a year. A duck becomes friends with Death, and it’s the most natural thing in the world. Trust me, adults get far more weirded out by this book than children ever do. Amazing. This is an extraordinary book, simple, powerful, unsentimental yet somehow tender, and an important addition the the ‘grief’ genre. When Duck notices Death, a skeleton in a checked robe carrying a black tulip, following her she is frightened. Together Duck and Death strike up an unlikely friendship as they speculate about the afterlife and both begin to accept the inevitability of the outcome. When summer ends Duck feels cold so she lies down and asks Death to warm her. As she stops breathing Death stokes her feathers, and gently lays her on the water and helps her drift away. Duck, Death and the Tulip by Wolf Erlbruch is a superb picture book from Germany, that tells a gentle story of the relationship between Death and a duck. Death is portrayed as a sympathetic figure in a dressing gown who is with us all the time, but who only comes into Duck’s consciousness towards the end of his life. It is warm, poignant and witty. The most moving book I’ve read this year is the German picture book Duck, Death and The Tulip by Wolf Erlbruch, about the strange, uneasy friendship that develops between a duck and death, as the two move hesitantly towards a kind of comfortable familiarity. I can’t think of another book that tackles so huge a subject with such simple, heartbreaking eloquence. At the moment Older Brother, Little Brother and I are in the middle of an intense week of rehearsals for the Ryedale Festival’s Community Opera (in North Yorkshire, UK) – this year’s production is a modernised version of the 15th Century English morality play Everyman by Em Whitfield Brookes and Tim Brookes. In a nutshell, it is about Death sent by God to summon Everyman, who is not at all ready, spiritually, to meet his Maker. Duck’s musings offer much food for thought: all the time she is preparing herself for the fact that sometime soon, she’s not sure exactly when, she will die. Erlbruch’s writing is deft in expressing the tension between loving life and preparing to let go of it. 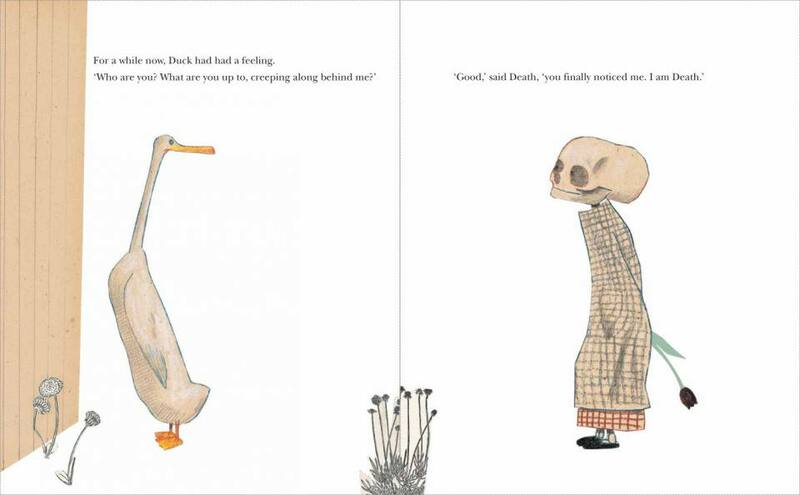 His artwork is haunting too and Duck, Death and the Tulip is a worthy follow-up to Erlbruch’s 2006 Hans Christian Andersen Award for illustration. A caveat, though: straightforward as it appears, Duck, Death and the Tulip raises complex ideas, which need to be given discussion space. This, however, may be as much to reassure adults that the book has indeed conveyed its life-affirming core, as to clarify any misunderstandings on the part of children. It would be a good choice of story to talk about the death from old age of a loved one – though not when grief is raw. Our context was Everyman. Erlbruch’s cultural heritage includes Schubert’s Death and the Maiden. What stories do you have in your culture which link Life and Death? Children’s books about death are understandable scarce – it’s a tricky, potentially gloomy topic. 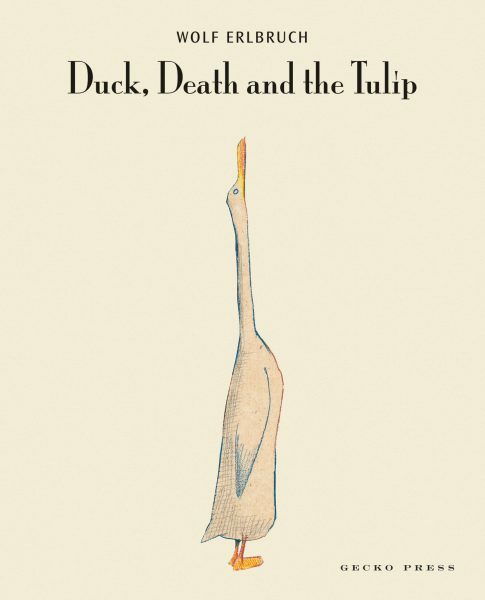 Duck, Death and the Tulip by Wolf Erlbruch handles the issue in a strangely appealing and even life-affirming way. Death (a smiling skull in a dressing gown) comes to take Duck away but she befriends him first. They play and discuss the possibilities of life after death, but Duck eventually dies and is carried away by the Great River. The last line is a beauty: But that’s life, thought Death. The illustrations are an exquisite mix of drawing and collage. This sweet little story is translated from German, the gorgeous illustrations by Wolf Erlbruch bringing the entrancing tale to life. It’s the story of a Duck, and her dance with Death. Only, instead of being one whirling, scary ride, it’s more like a sedate, soothing waltz. The minimalist illustrations, depicting interactions between the rather grandfatherly figure of Death and the inquisitive Duck, are beautifully rendered pictures which tell most of the story without words. The ending isn’t sad, because it’s just life. And though this book may be intended for the more adult reader, it’s told so philosophically, and with such inherent humour, it’s suitable for kids of any age. 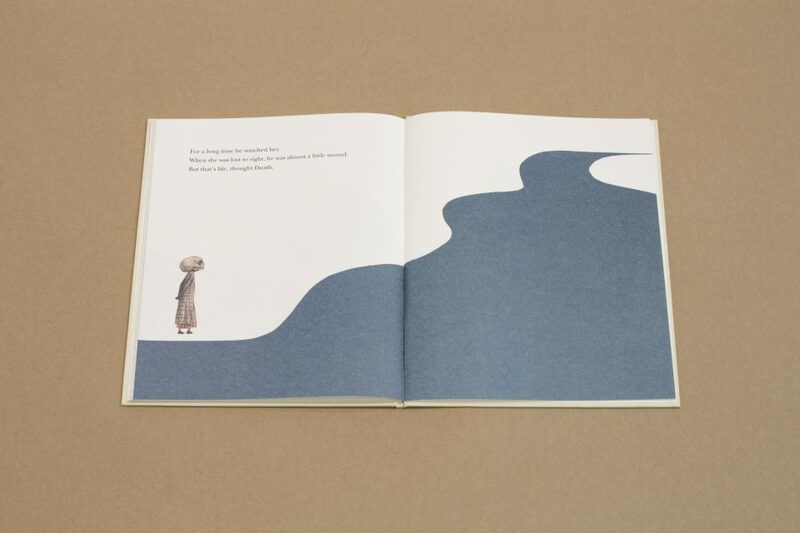 The first thing the reader notices about this exquisite picture book is its visual simplicity. Erlbruch composes sketchy line drawings of the two characters – Duck and Death – in soft beige tones on high quality, creamy-white pages. One of the very few touches of colour is the purple tulip which Death carries behind him at the beginning and uses at the end to gently send Duck on her way. This understatement allows the author/illustrator to focus our undivided attention on the changing relationship between Duck and Death. Death joins Duck as an initially unwelcome companion, explaining that he must be there `in case’. An unlikely friendship develops between the two, with friendship’s quarrels and reconciliations. Death has an endearing personality and Duck is amazingly tender and kind – warming Death with her feathery cloak when he feels the damp down at the pond. The second thing the reader notices is the extraordinary courage of the book – the uncluttered nature of its graphics, the uncompromising excellence of its design and production and its honest message that `Death is always with us’. Gecko Press is to be congratulated on producing such a haunting, elegant and affecting book on an important theme. Duck, Death and the Tulip by Wolf Erlbruch is .beautiful and one of the best books about death I’ve ever seen, for any age. I think this is a wonderful book. I really liked the way death is portrayed in such a way as to be non-threatening. Death truly is part of the life cycle in this book. Duck sees death as almost a friend because she has reached the end of her life span; the idea of death being quite natural in this way is a very comforting one. The illustrations reinforce this, especially the tender and loving one of death carrying Duck to the great river – which, in itself, is a lovely metaphor for Death himself. Death here is no Grim Reaper; he is a gentle part of the lives of all creatures. 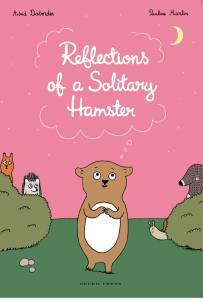 This is a book which would be a great stimulus for discussing these complex issues with children and may well be a comfort to them at a time of the loss of an older relative, for example. Being a bit of a wimp, I was quite frightened by Duck, Death and the Tulip. Duck befriends Death (a yellowed skull with a fixed smile) and, well, you can guess what eventually happens. German illustrator Wolf Erlbruch manages to infuse both the stench of death and the fragility of life into his simple, elegant drawings. In tone, if not in style, they bring to mind the dread images of his compatriot Otto Dix. So, not really a bedtime story for the very young – you’ll get far too many questions of an existential nature that you can’t hope to answer. With a truly Germanic take on life and its ending, we walk with Duck through her last days as, accompanied by Death, she finally breathes her last breath and is laid by her companion on the river that takes her away forever. Personally I found this book life affirming, particularly for the way in which Duck accepts so completely what is happening to her: others may find it totally distressing. 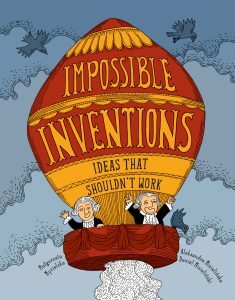 In my opinion this is a book to share carefully with a small group of children or teenagers, being prepared to stop and talk about the ideas it brings up in the listeners’ minds. If I bought this for a library collection I would want to make sure anyone who was likely to come in contact with it had an idea about its contents, especially vulnerable teenagers. Has ever a book evoked more discussion on the School Librarians Listserve? John: This is a stunning story and a whimsical look at a serious subject. It deals metaphorically and overtly, if that’s possible, with the reality of dying, in a picture book and in a way it’s like nothing I’ve ever seen before. It’s been so powerful there’s been a huge debate among school librarians as to its suitability. The problem they see is it’s a topic that’s not something that should be so graphically covered and the related perception is that children’s books, picture books, are only for children. That’s contestable: the subject of death is a big issue for kids and one they want to rationalise and over the past ten years the whole picture book genre has become extremely sophisticated and it’s used as a vehicle to cover a whole range of subjects. 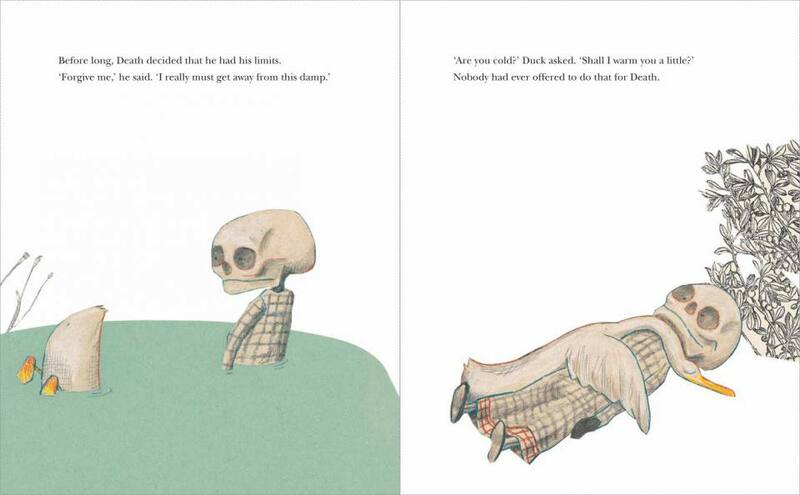 Here the story deals with a warm and affectionate relationship between Death, portrayed as a skeleton in a dressing-gown and slippers and the soon-to-die Duck. Now here’s a snippet: ‘ `Who are you? What are you doing creeping along behind me?’ `Good,’ said Death, `you finally noticed me. I am Death.’ Duck was scared stiff and who could blame her? `You’ve come to fetch me?’ `Oh, I’ve been close by all your life – just in case.’ ‘ And then they have a discussion as to what could happen to Duck. Death explains you could have a nasty cold, an accident or …Fox perhaps. Duck tries not to think about Fox. So they wander down to Duck’s pond and they play a little until Death finds the damp too much and they lie down together so Duck can warm Death up and the friendship grows between them and they discuss all the aspects of dying until one day at the end of summer Duck begins to feel cold and asks Death to warm her. Now the next bit’s as obvious as it is inevitable and Death farewells Duck, he’s almost moved and Death says `’But that’s life’. Kathryn: It’s the grim reaper but much friendlier. John: In the story and the illustrations we’ve got this life-affirming message about death. How’s that work? Kathryn: Accepting the inevitable, yes. John: There are a number of very effective visual metaphors: a black tulip, there’s a raven, a lurking fox but the brilliance is in the simplicity and the beauty and warmth of the story come from that gentle humour for [what is] normally such a sombre subject. Kim Hill’s ‘favourite book of all time’ is certainly a very special surprise and a welcome foray into taboo territories explored by people like Heinrich Hoffmann, Maurice Sendak, Edward Gorey, Mervyn Peake, Kafka…What should, in theory, be ghoulish, damaging, nightmare material is actually soft, friendly, funny – and a little sad. That strange, half-dream world where we (including little children) can find ourselves truly alone, and yet seem to experience a calm but forthright companionship, is unflinchingly evoked in these sparse words and pictures. There’s lots of empty space and very few other things to see on each page other than the gangly, awkward Duck and Death in his jumble-sale attire. Of course you are left in no doubt from the first page of the inevitable outcome, so it’s not a will-he-won’t-he scenario; it’s more when and how (why doesn’t get a look in!). I can make no better recommendation than to reiterate some words on the book’s cover: ‘elegant, straightforward and, above all, life affirming’. Likewise, one of [Gecko Press’] latest books, Death, Duck and the Tulip, is not a typical picture book. It deals with the weighty issues of life and death. [The publisher] has called it ‘a picture book form of The Book Thief’. And, like that very fine, extraordinary novel, it certainly is a brilliant, thought-provoking book featuring Death as a main character. This is a large-size picture book with an equally big heart. Its author/illustrator won the 2006 Hans Christian Andersen Award for illustration. In the jury citation he was described as `one of the great innovators and experimenters of contemporary children’s book illustration. Sometimes simple and elemental, at other times dense and intricate, he is always playful, humorous and philosophical.’. Erlbruch’s style tends towards the minimalist: his favourite technique a combination of drawing and collage. Simple forms exude complex interpretations. In the case of Duck, Death and the Tulip the artist is at his minimalist and sublime best. The empty spaces surrounding the two protagonists, Duck and Death, shout for attention and work on a level that is far more then simply excellent design. These spaces echo the deepest fears of Duck as she prepares for Death. By turns moving, humorous and sad, this book offers readers of all ages a range of emotions and experiences. It does so as much in the illustration as in the text. With its illustrated collages, the shapes of Duck and Death come to expressive life in the subtle angle of a mouth, the telling tilt of a head. Has Death ever been so warmly drawn? And the tulip in the title.it has a presence at the start and end of the story, but is absent from the middle when Duck and Death forge their unforgettable bond. What is its role? As a harbinger of Duck’s fate and as a simple wreath for Duck as she sets of on her journey on the great river. At that point Death, clearly not devoid of emotion or empathy, is `almost a little moved’ but remains the pragmatist nonetheless: .’that’s life, thought Death’, a statement that becomes an affirming irony in the context of the tale. The final illustration of a fox and a hare gambolling around a meditative Death (or is Fox hunting Hare?) serves as a silent coda that it’s not only Duck who will, at some point, encounter Death. Few readers could fail to be impressed in one way or another, by this outstanding book. It’s haunting and it’s hopeful. What more could anyone ask of great literature? Most adults don’t know exactly how to breech the ominous subject of death with their children and often come up with a euphemistic metaphor that may far from adequately explain the end of life. So for a book to be able to offer children, and their parents, a clear and uncompromising view of death without being too scary or saccharine is a triumph. Duck, Death and the Tulip by Wolf Erlbruch does not sanitise dying and does not give it a comfortable cop-out of eternal bliss offered by so many popular religions. What this book does is to allow the reader to investigate their own philosophical view of what happens when we die. In an age when the Judeo Christian religious version of heaven and hell is no longer the standard belief default in Western Society, people are free to formulate their own view of mortality and how it relates to their perspective on living. Duck, Death and the Tulip provides a vehicle for exploring our own beliefs for both adults and children. Personally, I don’t want to be a parent who tells their child that Grandma is up in heaven or sleeping forever when that is not something I believe myself. I don’t want to scare them with threats of hell fire or have them brainwashed by fantastical promises of an unsubstantiated utopian afterlife. Our whole philosophical worldview is based on metaphors we construct for ourselves out of ideas that make sense and I like the concept that this little book espouses so elegantly. The illustrations are deft in their sensitivity and clarity. The character of Death is depicted as a dressing-gown clad figure with a stylised skull for a head. Obviously any representation of a skull comes heavily loaded with our pre-conceived baggage that we hang on this symbolism, but the look of the character is softened by the rest of the figure who looks like they are perpetually ready for bed or haven’t bothered to get dressed for the day. Death is not mean, nor is she woolly in her approach to the terminus which she represents. I guess the big question for anyone before they read this, is what is the philosophical conclusion of this book if it is not heaven or hell? Give it a read and it might give you something to consider as you take one more step towards the inevitable. It is hard to believe that there could be a more beautifully understated and poignant book about the endgame that stalks us all than Duck, Death and the Tulip. The format suggests a children’s book, but the short tale of a charmingly guileless Duck befriending Death when he creeps up behind her feels ancient in its wisdom. 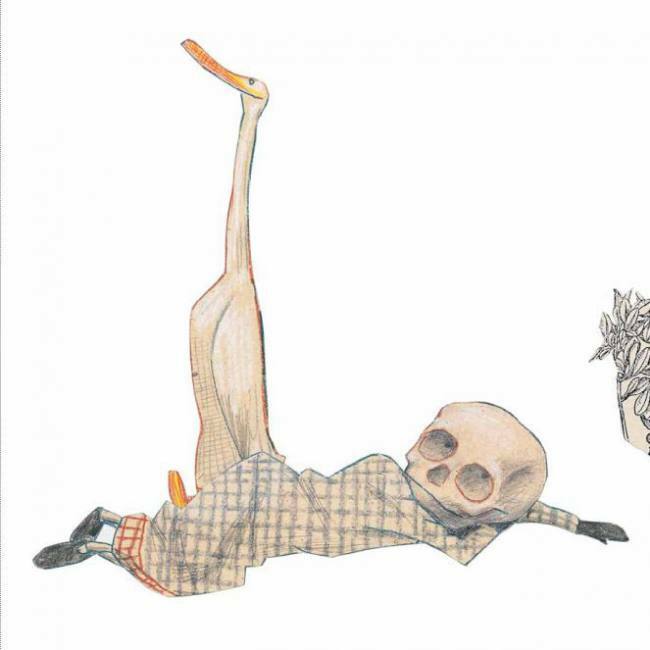 Erlbruch’s artwork, combining drawing and collage, is mermerising, applied with great subtlety and care to convey precisely the pathos, futility but also the unwitting affection of Duck’s innocent dance with Death. So too the narrative, translated from its original German into English by Catherine Chidgey – is hauntingly spare and precise. Anybody who cares for the fragility of the spirit will be captivated, and moved. Duck, Death and the Tulip is another beautifully presented book from New Zealand’s Gecko Press. Erlbruch, who also wrote The Mole Who Knew It was None of His Business, has written about a subject we all have to face sooner or later. And he has written about it in a winsome, heart-warming way. Duck realises someone has been following him for some time and strikes up an unlikely friendship with Death, portrayed as a friendly skull wearing a tartan dressing gown, who doesn’t like swimming. The illustrations are very simple and the message is clear: death is part of life. There is no religious message, and when Duck suggests she may become an angel on a cloud, Death neither denies or confirms. ‘Maybe,’ he says, ‘you have the wings already.’ This is a book which parents will want to supervise with their children. It is not an easy subject to approach, but this book does it gently. While the book may be acceptable to some 5-year-olds, it should be at the discretion of the parents and older children may be able to deal with it better. But adults will find this attractive book very thought-provoking. Simple it may be – but not for the very young. Duck, Death and the Tulip transcends categorisation – not since John Brown, Rose and the Midnight Cat has a picture book so eloquently addressed the idea of impending death. As in Markus Zusak’s The Book Thief, where Death is also an active player, German Wolf Erlbruch’s simple text (translated by Catherine Chidgey) with [its] gentle puns and pared-back, androgynous pictures reinforce the idea of death as an integral part of life. Duck discovers that while Death has always been around, he is not there to ‘make something happen’ – life itself does that; Death simply waits in the wings until he is needed. One day, a duck notices Death creeping along behind her. She is scared stiff but as they talk, visit the pond and climb trees, her initial fear gives way to acceptance and friendship as her life moves inevitably towards its end. hollow eye sockets glow with expression. mysterious event towards which all life is headed. This is the book that Kim Hill deemed her favourite book of all time. It’s a stirring, deep and gentle picture book about death, suitable for older children and adults. 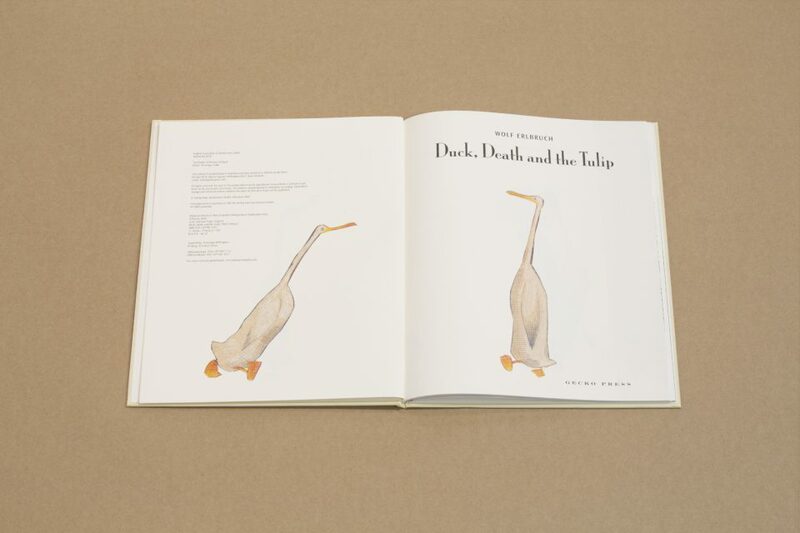 It is so complete – the beautiful words and the wonderfully evocative illustrations – every home should have a copy of Duck, Death and the Tulip. 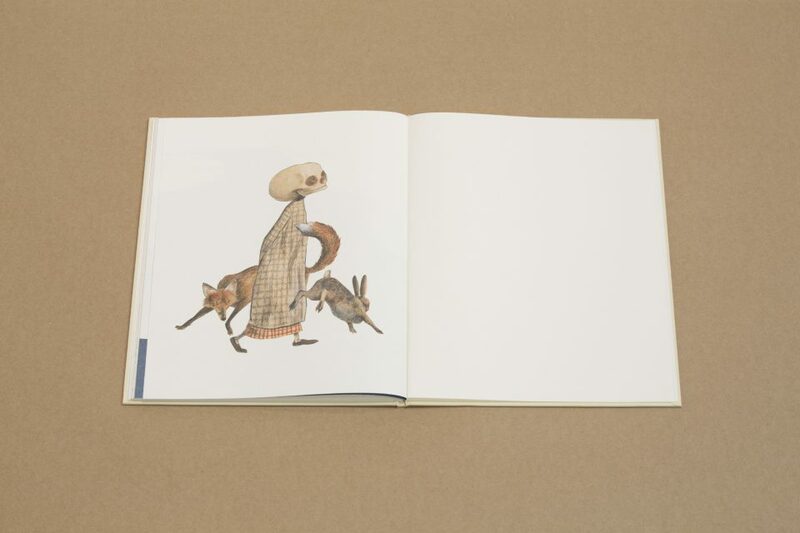 Death can be a bewildering, scary concept to explain to children so Erlbruch’s quirky tale with his own equally quirky pictures may be very useful – for adults as well as children. Duck meets and befriends Death. Together they explore Duck’s favourite places, and a few of Death’s. However, time is passing and the inevitable happens to Duck but Death is kind and gives her a peaceful, graceful exit. Another unusual, quality book from Gecko Press. Like the fox and the rabbit featured at the end of this story, we all like to dance around Death. But German author and illustrator Wolf Erlbruch doesn’t let readers – or Duck – off lightly. This beautifully illustrated volume may confound those used to ducks being funny. (Do you think Daffy ever grappled with the existential angst Erlbruch reserves for his little Duck?) Plain-speaking Death does not sugar-coat the subject nor resort to euphemisms. Ultimately, though, this book invites more questions than answers, so be prepared for lots of questions (especially your own). But don’t be too hard on yourself if you can’t supply all the answers, because, as it turns out, neither can Death. 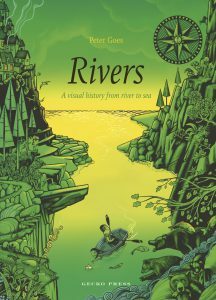 This is a great way to introduce young readers to a subject that is complex and confusing. Once more Gecko has unearthed a gem with its translation of a bittersweet work by an award-winning German author. You know when Duck meets Death on the first page that things aren’t going to turn out well but this haunting and sparely illustrated book somehow manages to be heart-warming and humorous. Some nice lines, too, such as Duck suffering goosebumps and Death observing at the end, ‘But that’s life.’ Get the hardback ($29.99) because you’ll want to keep it. Death isn’t a subject you encounter in most children’s books. But in Duck, Death and the Tulip death walks, talks, smiles and climbs trees. ‘You’ve finally noticed me,’ says Death to Duck. And so begins a conversation that sees Duck warm to her new companion and become his friend. ‘He was nice if you forgot for a moment who he was’, she says. Duck, Death and the Tulip by German author and illustrator Wolf Erlbruch will intrigue, haunt and enchant readers of all ages. The book deals with a difficult subject in a way that is elegant, simple and life-affirming. Publisher Julia Marshall says she chose the book because of the way it moves people and because of its extraordinary beauty. This is a delightfully presented story which presents the character of Death in a developing relationship with a duck. 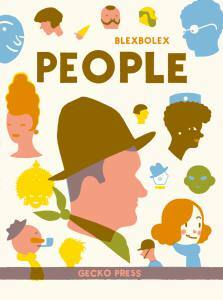 Wonderfully illustrated, the tale has poignant moments of insight and warmth. In its open-minded approach to the often-avoided subject of death, the book brings a warm and positive message to readers of all ages. I thoroughly recommend it. must kind of acknowledge that. Kim: I love that book. the skull of Death and Duck poking out of a tree. Kim: It’s an artefact, alright. just the other side of the coin. Hasn’t he got the most endearing face? Do you think of him as a he? Kate: Who would you give this book to, Kim? Who would you read it to? Kim: I’ve left it in the spare bedroom for everybody. chooses to come into focus, we don’t know. Duck Death and the Tulip is the most beautiful beautiful beautiful book. Duck meets Death and Duck has to learn what Death means. It is a wonderful narrative about how we die and what happens when we die. Death is a completely sympathetic figure. I would give it to a five year old, I would give it to a two year old, I would give it to a grown up. I almost cried when I read it the first time. It is perfect and beautiful. Get it! Duck, Death and the Tulip is now my favourite book of all time. I love it. There’s a beautiful picture, a drawing, in here, of the duck draping itself over Death in order to keep it warm…. the whole thing is worth reading again and again…I’m going to go home and put it on the table and invite everybody to pick it up. A beautiful book about death and his friend. This is the best book about death I have ever read. It’s sad but uplifting at the same time. The illustrations are beautiful. A book that is as much for adults as children. In a strangely heart-warming story, a duck strikes up an unlikely friendship with Death. This translation of Erlbruch’s masterpiece will intrigue, haunt and enchant readers of all ages. Simple, warm and witty, this book deals with a difficult subject in an elegant, straightforward way. The story shows death as a part of life and leaves the reader with a sense of both sadness and hope. The illustrations are understated but charming, and the image of death and duck conversing gently about life will stay with you for a long time. Duck notices someone ‘creeping along behind’ her and turns to confront Death, who once you get over the shock of a skull sitting atop of a long, loose checked gown, bony ankles showing above flat shoes, turns out is ‘Actually… nice, if you forgot for a moment who he was…’ And so Duck and Death share time together, Duck questioning Death on the hereafter while Death remains noncommittal. When the inevitable happens, death is treated with the compassion demanded by one of life’s great rites of passage. The illustrations are minimalist, the two characters depicted against cream backgrounds with only the occasional depiction of a door, a pond, a tree. Neither the text nor the illustrations are sentimental and yet this is lump-in-the-throat reading in an affirming manner. Watch out for the tulip of the title. It is not mentioned in the text. 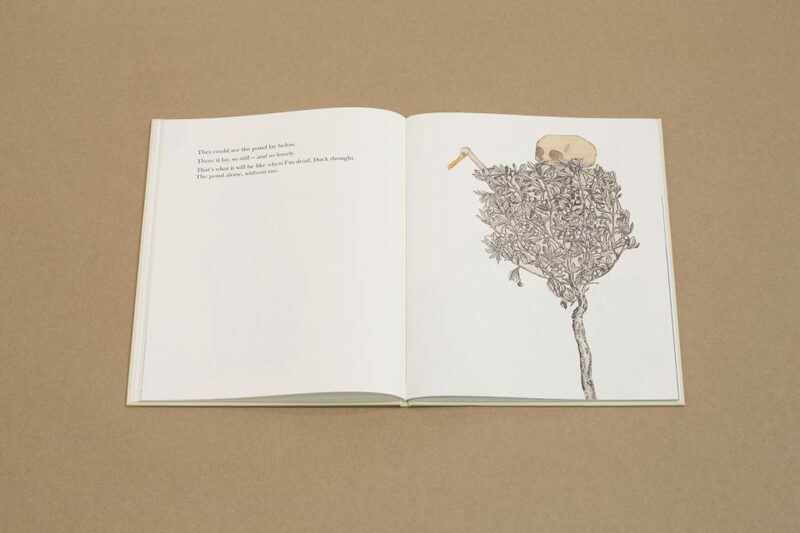 Duck, Death and the Tulip is a book bound to engender discussion, not only of the subject but on the way in which the author/illustrator has approached such a heavy subject; is it, for instance, for a child? Best perhaps to say it will find an audience from the whole spectrum of ages, each reader taking from it something different. those children who are grieving with loss of a loved one. moving, the way that duck embraces Death as a friend. 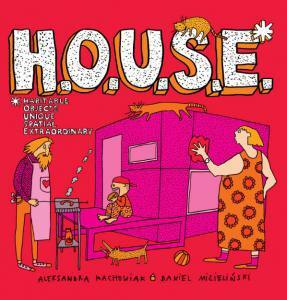 Looking at this exquisitely illustrated book one is not surprised to learn that German illustrator Wolf Erlbruck won the Hans Christian Andersen Medal for Illustration in 2006 for his previous title to go alongside the many other awards he has won previously. He is super talented. This is a warm and witty story, if somewhat challenging and haunting perhaps for younger children dealing as it does with the subject of death. Radio New Zealand’s Kim Hill went so far as to call it her favourite book of all time and one she reads over and over again. Translated by New Zealand author Catherine Chidgey and edited by Penelope Todd. Another winner from Gecko Press. I’ve been talking to people about this in advance, having seen a copy in the original German a while ago, and an English copy last month, and here it is. By Wolf Erlbruch, the illustrator of The Story of the Little Mole who knew it was None of his Business, translated by Catherine Chidgey, this is a quintessential Gecko Press Book. The British and Americans, from whom we get most of our imported books, are somewhat squeamish about things like defecation and death, but many European societies are not, which is why some of the Gecko Press books have been such valuable extenders of the topics discussed in children’s books. This will provoke discussion, with some parents and grandparents feeling that death, or Death in this case, is an unsuitable topic for a children’s book, but with some others who have already reviewed the book, I love it. Duck notices one day that someone is creeping along behind her. When accosted, the follower says, ‘Good.you’ve finally noticed me, I am Death.’ After a few moments of terror, ‘and who could blame her?’ Duck realises that death is really quite friendly, ‘if you forgot for a moment who he was,’ and she takes him to her beloved pond. ‘Death had been dreading that,’ and when he can’t stand the damp any longer, Duck offers to warm him. ‘Nobody had ever offered to do that for Death.’ When the inevitable end comes, Death lays her on the river. ‘For a long time he watched her. When she was lost to sight, he was almost a little moved. But that’s life, thought Death.’ Beautiful minimalist illustrations which add to the poignancy and humour. On the final page, or endpaper, without words, Death walks away, a very cunning-looking fox chasing a bounding rabbit around his legs. Every word, every picture, every gesture is right, and adds to the story and the feelings evoked. As the blurb says: ‘elegant, straightforward, and life-affirming.’ Wunderbar! Watch for the tulip, important enough to get a mention in the title, but never mentioned in the text.